The likes of Victoria Beckham, Gwyneth Paltrow and Jennifer Aniston are all fans of the alkaline diet, but this isn’t just another celebrity fad. 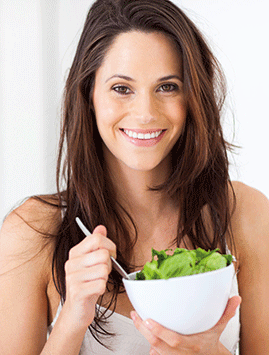 There are many benefits to be gained from alkaline-based nutrition. Our blood should be slightly alkaline with a healthy pH balance between 7.35 and 7.45. If we eat too many acid-forming foods this can lead to an unbalanced pH level. This in turn stops the body from removing toxins, slows down your metabolism and makes it vulnerable to viruses. Too much acid causes disease, because an acidic environment makes way for harmful bacteria to rapidly grow and multiply. The alkaline diet (also known as the acid-alkaline diet) is specifically designed to help restore the pH balance in the body. In order for it to be in balance, your food intake needs to be approximately 75 per cent alkaline and only 25 per cent acidic. The acid-alkaline diet is based on low glycaemic, low inflammatory, non-processed food. The diet involves eating plenty of high-fibre fruit and vegetables which help to detoxify the body and increase your metabolic rate, meaning that you can lose excess weight fast. Once the digestive system is able to function properly, you will no longer be weighed down with heavy toxins that cause you to feel lethargic and fatigued. Inflammatory components will be removed from the body a lot quicker. With less acid in the body, the bad bacteria which cause various diseases will rarely be able to grow or multiply to the point where the body cannot fight them off. Eating too many acidic foods throws the body’s pH levels off balance, producing toxins in the body that can feed skin sensitivity and conditions such as eczema and acne. Collagen within the skin can also break down, resulting in wrinkles and dryness. The antioxidants in fruit and vegetables neutralise the toxins, and are able to prevent and even reverse the signs of ageing. Our bodies function best when in an overall alkaline state so it’s best to eat plenty of foods that have an alkaline-forming effect on your system. The vast majority of highly processed foods – like white flour products and white sugar – have an acid-forming effect on your system and lead to an unbalanced pH level. Drinking pure, alkalised water helps to balance pH levels. Alkalise your water in the house using a water distiller, an ionizer or a special filter you can install under the sink or on a showerhead. Add slices of organic lemon to drinking water. Lemon is very good at balancing pH levels, shedding off excess acid stored in the body, and is very high in vitamin C to strengthen the immune system. Drink lemon and warm water early in the morning on an empty stomach.